A while back I was speaking with a dear sister in the faith (we’ll call her sister V) , and we were talking about all the winds of doctrine flying around today. So many “rabbit trails” as she called it, of false ideas and deceptive paths, that there can only be one master planner behind all this–our arch-enemy– Satan. “The enemy is preparing for his last campaign against the church. He has so concealed himself from view that many can hardly believe that he exists, much less can they be convinced of his amazing activity and power. They have to a great extent forgotten his past record; and when he makes another advance move, they will not recognize him as their enemy, that old serpent, but they will consider him a friend, one who is doing a good work. Boasting of their independence they will, under his specious, bewitching influence, obey the worst impulses of the human heart and yet believe that God is leading them. Could their eyes be opened to distinguish their captain, they would see that they are not serving God, but the enemy of all righteousness. They would see that their boasted independence is one of the heaviest fetters Satan can rivet on unbalanced minds. .. Man is Satan’s captive and is naturally inclined to follow his suggestions and do his bidding. He has in himself no power to oppose effectual resistance to evil. It is only as Christ abides in him by living faith, influencing his desires and strengthening him with strength from above, that man may venture to face so terrible a foe. Here we see that our enemy is “busy every moment” and seeks to “devour” us. And just how does he do this? Yes, rabbit trails are one of his most useful ploys! From the part-time believer to the advanced Elijah messenger, it’s makes no difference to him. If he can get us to go down one of his trails, he has us in his clutches. 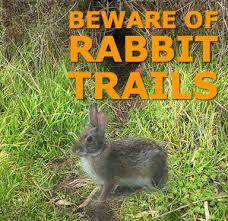 Let us look at two of Satan’s popular rabbit trails today. Just recently, and the motivation for this post, a sister whom I had thought was learning the Lord final message of Elijah quite well emailed me with a curve ball (let’s call her sister C). She basically said that we must start obeying the Sabbath according to the Scriptural Sabbath and not according to the Roman calendar (our current calendar). You see this sister has went on a few sites that are proclaiming this new idea of obeying a different Sabbath and has bought it hook line and sinker. But let us look at how people who take up these strange new ideas are setting themselves up for failure just as Korah and his men of renown did. So logically if the Sabbath day (our current calendar of Saturday) is not correct and we should obey another day as the correct Sabbath, would not God have told His Elijah prophet to “restore” this? Absolutely. But did He? WHICH IS THE SABBATH CALENDAR? In keeping the Sabbath, are we to go by the present calendar? Here we see that our seven-day cycle has not changed since creation. Further, the Jews of old (Moses’time) keep a certain 7th day religiously. They were consistent even to Christ’s time, and thereafter the Apostles and their followers as well. All the way down to our time. So we see that this rabbit trail really goes nowhere good! You see brethren the message shows that this trick will lead all into “perdition”. This sister C has decided to travel this rabbit trail and when she does, her trail builder may get her to break the real 7th day, for a false 7th day. Exactly what he hoped to do! All the while she thinks she is enlightened just like Korah did. For he thought he was walking with God and did not have need of obeying God’s chosen prophet. After reading the above, what makes us think we are any different from what Korah was? Can we tell God’s prophet that he missed something and we know better what to do? Is this not an insult to our ALL-SEEING AND KNOWING GOD? Another rabbit trail is the issue of –calling God’s name properly. In other words some think they find out the”correct” way of calling Him, instead of saying “God” or even “Jesus”. When they find this out they then are led to believe that this issue is so important that if you do not address His name properly your salvation is in jeopardy. The same friend, sister V, told me about a time recently where she was on a phone conference call with some present truth believers. She relayed that in the call a woman spoke up and said she has now learned God’s “real” name and that they all should learn it, and if they don’t she feels like she should not even speak to others who “degrade” His name! Sister V was flabbergasted. This seemed like a Pharisee rule of long ago. Remember when they would actually measure the distance away from the synagogue and you could not walk one foot more than that to it? Well this is about the same! ” Is it not a fact that the Bible translators changed the Creator’s original Hebrew names (Elohim, Jehovah, El, Elahh, Elowahh, Bethel, and Tsur) to the names of Baal (God, Lord, etc.)? And if the Creator’s names actually are Elohim, Yahovah, et al., and if God, Lord, etc., are the names of the pagan gods, why, then, do we call Him by the latter? Hence, if we must attach more sacredness to letters expressing Deity in any one language more than in another, it should be Only In The Language of Eden, or In All Alike. Irreverently Using the Lord’s Proper Name. “If God’s proper name is Jehovah, then dare we His created beings, be so disrespectfully familiar as to address Him by His Proper Name, rather than by one of His titles, God, Lord, Father, Creator, Saviour, etc., when we would not think of indulging the less disrespectful familiarity of addressing our earthly parents by their given names – John, George, Bill, Dorothy, Ruth, Mary, etc., – in place of their parental titles Father and Mother? Such irreverence practiced by the heathen might be excusable because of their ignorance, but practiced by enlightened Christians, who ought to know better, it is inexcusable. We may with reverence use the word,Jehovah, only if a heathen should ask us, Who is your God? Then we could with solemn propriety answer Jehovah, the only true and living God. Never, though, when addressing God, can we reverentially use His Proper Name. However, the most ancient and hallowed Hebrew name for God was not only never commonly pronounced, but was even so-spelled, in an abbreviated form, that it could not be pronounced; so much so that the original pronunciation is not known. All we know for sure is the Consonant Form, Yhwh, Yvh, or Yhv. If the original-name theory had proved correct, there is in the way Nothing to Prevent the Change. In closing we can see that we must very careful not to be led down one of Satan’s rabbit trails. They will lead to a place we don’t want to go. The above word of God is too plain for us to misunderstand. This crying aloud has been a Biblical trait from the people of God since ancient times. The prophet Amos knew all too well that this crying out the straight forward warning is not readily accepted by many, and often by those today who proclaim themselves as Christians, even some advanced Elijah messengers. But why is this faithful act so often misunderstood? Let’s take an in depth look at it. We as Seventh-day Adventists hardly ever see or hear of someone warning others in a straight forward way, just as they did back in Amos’ day. “The gate” is the well-known place of concourse, where just or, in Israel now, unjust judgment was given, where all was done which was to be done publicly . Samaria had a large area by its chief gate, where two kings could hold court, and the 400 false prophets and the people, in great numbers, could gather and a market could be held . Josiah broke down an idol-shrine, which was in one of the gates of Jerusalem. The prophets seized the opportunity of finding the people together, and preached to them there. So it was even in the days of Solomon. “Wisdom crieth without; she uttereth her voice in the streets; she crieth in the chief place of concourse, in the openings of the gates, in the city she uttereth her words, How long, ye simple ones, will ye love simplicity?…” and again, “She standeth in the top of high places, by the way, in the meeting of the paths. She crieth at the gates, at the entry of the city, at the coming in at the doors; Unto you, O men, I call, “Pro 8:2-4. Jeremiah mentions two occasions, upon which God bade him reprove the king and people in the gates of Jerusalem . There doubtless Amos and Hosea reproved them, and, for reproving, were “hated.” As Isaiah says, “they lay a snare for him that reproveth in the gate”. They sinned publicly, and therefore they were to be rebuked publicly. They sinned “in the gate” by injustice and oppression, and therefore were to be “rebuked before all, that others also might fear”. We can gleam much from the above short synopsis. We see that the prophets found gatherings as an opportune place to rebuke “open sin” and to place warning in front of all, that the honest and God-fearing among them may be set straight, hopefully repenting. Their conscience needed to be aroused. A while back a fellow present truth believer said to me ” our people are in a coma”. I could not have said it better. So I thought, “how can they be awakened?” One of the ways is the straight testimony from the pulpit. But how often do we see that? Not frequent. Let me tell you of another way, a way that hearkens back to the “old days”, a way that clearly shows the rebukers lifting their voice “like a trumpet” at the “gate”, a place where the people of God gather. Her name is sister Patricia. Her and her two children have a ministry where they travel to different SDA churches around the country and world. They bring with them Tracts, CD’s and DVD’s. They also carry signs of warning. For instance , during Christmas, they may have signs warning against the pagan practice of Christmas. Recently they traveled to Michigan to Doug Batchelor’s seminar at a church in Lansing. I had been in contact with her prior to the event and she let me know she would look into it and possibly make the trip (she’s from Michigan). So they soon went to the event. The first night they were able to get inside and see Doug speak. But as present truth believers , their love for souls just could not sit back and “enjoy” a seminar of basically peace and safety. As we are surely aware, the Lord through His prophecies show that the Lord “will suddenly come to His temple.”(Mal. 3:1). There is warning message now to be given. During their last siege, their signs included “S.D.A Does Abortions Just Like Planned Parenthood” and “We Love You”. They recorded it and later placed it on their YouTube channel for wider distribution. The Scriptures point to the people of God each having a specific duty to perform. “For we were all baptized by one Spirit into one body–whether Jews or Greeks, whether slaves or free–and we were all made to drink of one Spirit. For the body is not one member, but many. If the foot says, “Because I am not a hand, I am not a part of the body,” it is not for this reason any the less a part of the body. And if the ear says, “Because I am not an eye, I am not a part of the body,” it is not for this reason any the less a part of the body. If the whole body were an eye, where would the hearing be? If the whole were hearing, where would the sense of smell be? But now God has placed the members, each one of them, in the body, just as He desired. If they were all one member, where would the body be? But now there are many members, but one body. Now the eye is not able to say to the hand, “I have no need of you.” Or again the head to the feet, “I have no need of you.” But much rather, those members of the body seeming to be weaker are necessary, and the parts we consider less honorable, we treat with greater honor. And our un-presentable parts are treated with special modesty, whereas our presentable parts have no such need. But God has composed the body and has given greater honor to the parts that lacked it, that there should be no division in the body, but the members should have the same concern for one another. So we see that all of us , who proclaim to know Jesus and desire to work for Him and His kingdom, must respect what God has called another to do. We all cannot be the “hand”. Likewise we all cannot do the type of work sister Patricia and her family are called to do. But we do not call it wrong or misplaced work, because it is God’s work from long ago. His true “rebuking at the gate” work! “While others try to throw a cloak over the existing evil, and excuse the great wickedness everywhere prevalent, those who have a zeal for God’s honor and a love for souls will not hold their peace to obtain favor of any. Their righteous souls are vexed day by day with the unholy works and conversation of the unrighteous. They are powerless to stop the rushing torrent of iniquity, and hence they are filled with grief and alarm. Many of us are aware that the best magicians are those who have us watching the wrong hand. They attempt to have us focus on something that allows us to be tricked. We miss the real deal, the right action. Last Sabbath I had time to watch Walter Veith’s video called “Decoding the book of Daniel/ Daniel Chapter 2/ Walter Veith” on YouTube. Let me begin by saying that I personally have always liked Walter. His style is of the typical brilliant class professor. The one who has much intelligence and charm thrown in as well. I came to know about him back in 2009. I was given a DVD called “From Evolutionist to Creationist”. At that time I was beginning my SDA walk, and I was very impressed with his story. It took courage to change his views while being a high level Evolutionist. Walter has a very large following, particularly among the Seventh-day Adventist community. His teachings are regarded as high level and accurate for the most part. Although there are some leaders among the SDA that feel his conspiracy theories (ie. Jesuit knowledge and world conspiracies) go too far from mainstream SDA teachings. As mentioned he has that professor mentality and can really break down prophecies and other teachings as well. No wonder he is highly followed and relied upon by many SDA. His evolutionist professorship has refined his approach. But since I have been fortunate enough to be “guided into all Truth” (John 16:13) , the Spirit of Truth has erected the great “truth detector” in my life. After endeavoring to keep walking up the truth stair steps , and not content to stay on a certain level, I became aware of the true meaning of Daniel 2. This prophet, we as present truth believers know was Victor T. Houteff. Brother Houteff gave us the correct interpretation of Daniel 2. Once we study and know this understanding from the Lord’s Elijah, we can then be in a position to know counterfeits. Just like the professional currency detectors, who are able to distinguish the false from the true, based on their knowledge of the true, we can know error in prophecies simply because we can see all the holes, all the non-arranged pieces of the puzzle. So with this foundation I sat back and decided to watch the whole video, all 1 hour and 24 minutes of it. I knew that I was likely to find error because I know Walter, as far as I know has not accepted the teachings of our Lord’s prophet, just like the masses of our SDA church. But I wanted to compare what one of the popular teachers of our time was doing with what God’s word says. Let us now look at what Mr. Veith proposes as truth about Daniel 2. He begins by showing a “Dictionary of prophetic terms”. This is to help to decipher the vision. However the first mis-step I notice is that he leaves out the meaning of the “mountain”. Remember when we made reference to “the best magicians are those who have us watching the wrong hand”? So he starts out showing the Biblical meaning of — Trumpet, Rock, Zion, Woman, etc. yet fails to address Daniel’s “mountain” understanding. The “stone” comes from the mountain (not the sky) , so we need to know what the mountain symbolizes. He begins with a good historical breakdown of Daniel 2:1-25. There is some history on who the Chaldeans were and the backdrop leading up to Daniel coming to the king to give the interpretation. Now how can Mr. Veith proceed to teach his theories without explaining to us what the mountain symbolizes? After all the stone comes from it. If the stone “rock” is Jesus, it is symbolic, then the rest of the vision must have a symbolic meaning as well and be understood. Otherwise it is only guesswork. Mr. Veith goes on to describe the reason for the breaking up the statute, without ever coming back to explain what the mountain symbolizes. It is conveniently ignored. Mis-step number 2. This point is very important because we can establish just who the stone represents when we know from where it came from. In order to be Jesus the vision should show that the stone comes from the sky (heaven) yes? But it does not, it shows it comes from the mountain , which is on earth. The Word shows us the meaning of the mountain. Further references are found in Isaiah 56:7, 51:16, Jer. 51:25. So we see that the term “mountain” is used symbolically to describe God’s people, his church.So logically the vision must be understood in showing that the stone comes from the mountain, God’s people/church. Walter pays no attention to this very important detail and thus follows a rabbit trail into the false meaning of the vision. This is exactly why we needed a “restorer of all things” sent to us! The reason we need to point these errors out is because all of these mistakes are detrimental to the true intended interpretation of the vision. God’s lesson that was meant for us, is gutted by his lack of knowledge, his private interpretations. We see that DURING “in” the days of “these kings”, the 10 toe kings of the feet (our time), shall God set up His kingdom. You see Mr. Veith cannot show that part of verse 44 because to really dwell upon it one cannot promote his private agenda that the vision is describing Christ at the second coming as commonly taught among SDA leaders. So naturally he leaves that out to quash any thoughts opposite of his. While we can’t go into all the many points of the vision now, we can point out a few that are noteworthy. Aside from the long time erroneous interpretation of the stone being Christ, we know that this cannot be so for another solid reason. Once the stone strikes and destroys the image, the kingdoms symbolically, then the stone STAYS on the earth , fills it, and becomes a “great mountain”. When Christ comes at the second coming, His feet do not touch the earth, neither does He “fill the whole earth”. He draws all the saints living and dead up to Him and they are taken to heaven. The earth is then destroyed, dark and void, far from a great mountain, a great people on earth. But when we realize that the stone is cut out without hands from the mountain, we know that a divine intervention is made and a portion of God’s people are separated from the large mountain of God–His church. Who could this small portion be? Yes, it is the 144,000! The Ezekiel 9 church judgment is the “cut out of the mountain without hands” part . In other words, God performs this separation at the beginning of the judgment for the living in God’s house ( 1 Peter 4:17). We the SDA are His last church (7th of Rev. chapter 3) and this dream was meant for the us in the “latter days” as Daniel pointed out to the king. All should be aware the true interpretation is now available to all those who seek truth. The 144,000 then go out and give the Loud Cry with great power and thus the earth “kingdoms” are destroyed symbolically. No wars, but it’s God’s power through His servants that destroys. When Mr. Veith and others give their false interpretation of His prophecy of Daniel 2, they deny His plans, His final battle. The battle that He wins and all will see it play out–The stone destroying and then becomes a great mountain. Let us be clear here, we are not saying that Walter Veith is purposely being deceptive. What we are saying is that he is clearly showing that he has not accepted the Lord’s Elijah message, of which was given the true interpretation of Daniel 2 , among many other prophecies. And as he is a leading teacher, we strongly warn him and all who follow him and his teachings to come over to the Lord’s side–the Truth. Ok Walter, we take up your challenge. Read this post and see that you have not dealt fully nor truthful in your teaching of Daniel 2. Your lesson here is the general standard teaching of long ago within the SDA church. However that does not necessarily make it right nor truthful. In closing, our Lord wants us to know His true plans by way of His prophecies and not some false human interpretations. Soon His mighty army will go to work upon the world and be victorious (the stone destroying the image). This is for the purpose of the world seeing God’s real glory through His servants. In the line of command within our armed forces it is important to give and follow orders. This is vital to the success of the duty or mission. But more importantly, we will see the Lord wants us to be able to take and give orders in these very last days. Our very last prophet also gave some instruction on taking orders. “…you remember what took place the night of the Passover, the night before they left Egypt: Moses had proclaimed throughout the land that in every dwelling where no blood was found on the doorpost, that very night the firstborn in each such dwelling would die. We see that taking orders is a “prerequisite that we take orders if we are to receive the seal of God in our foreheads.” What an important instruction! Let us look at today’s applicable practice of this important instruction. The Centurion showed that he knew the power of Jesus’ orders, and that just at the mere mention of the Word, his servant would be well! Truly a man who knew how to accept orders! In our own personal walk, we know that the Lord can and does give us individual “orders” in the form of , for example, an instructive dream, a clear sign in answer to a prayer, a certain person coming to tell us a message, etc. 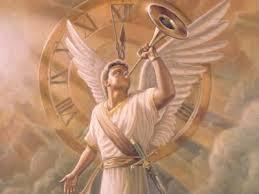 But there is a more frequent “order” given to us as God’s end time servants. It is from each other. Let me give you my own personal example. As one of the administrators of a Facebook group called Truth Tellers, part of my duties is to coordinate and issue “orders” as it were, to some of the members. We have certain studies every other week which we give to the members. In the course of the many years we have been on Facebook, I have learned the direct application of our post title. Usually most of those who I deal with are very cooperative and do as instructed. Unfortunately , I have met and seen some who simply turn down being asked to help participate in the useful studies. Of course everyone has a right to say no, but when we dwell upon the above Inspiration we must seriously consider our reasons why we say no to an “order” to go to work in His vineyard. So when we say no when being asked to do some work in His vineyard, are we asking others to do some work for us as well? Do we ask a knowledgeable brother or sister to help us understand a certain reference or passage of Scripture, Rod, or SOP? While this may not be considered an order, it is in effect just the same. We ask (place an order) to someone to do something to help edify, encourage, or support one another. As one of those who is busy in His vineyard, I also certainly respect any orders given me. If a brother or sister asks for anything that is within my power to do, I see to it to complete the request. Their orders, I know, are given to help them in some respect. So in effect we are giving orders and receiving orders to help the Lord’s cause. We are to be the Lord’s “servants” and if we want to be truly “great” we must be our brother’s or sister’s –servant. But those who selfishly turn down requests to help, must seriously look at their walk. Pride, selfishness, laziness, wrong priorities and a host of other reasons can very well be at the core of our refusal to “take orders”. Some may think it is beneath them to do something for a brother or sister. Our Master was the perfect example, washing the feet of His creation. As present truth believers we know that the current work for the church, the very last work right now- is the sealing of the 144,000. These 144,000 will soon become God’s army, the word shows they will be united and in order. Their orders will come from on High and they shall not break ranks. Unity based on following instructions will be paramount. One of the worse examples of not only not taking orders is looking the other way at brothers and sisters of the faith and ignoring them when they reach out to us. 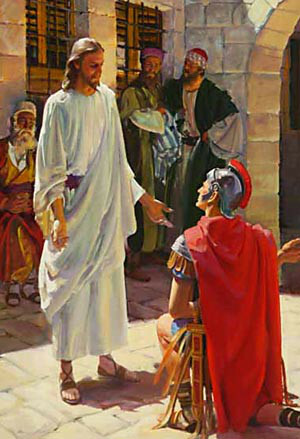 I often give this example, can we imagine Jesus looking at someone who is sincere who approaches Him and requests an answer to a problem or concern, then seeing Jesus say nothing and walk away? The Lord was there for any and all who were sincere and wanted help. Even the Syrophoenician Greek woman, was not ignored. We who claim to be God’s servants should 1) return phone calls 2) return emails or any messages 3) return letters . And most of all be ready to take orders with a happy heart. So the bottom line is that we need to decide whether we want to serve or be served, help or be helped, advance His kingdom or hinder it. Just this last Sunday evening about 10:45 pm Eastern time, Sept. 27th, the last of the four consecutive Blood Moons appeared as shown in the above picture. As many are aware that day was also the beginning of the Biblical ceremonial feast known as “Feast of Tabernacles”. While we as SDA and DSDA do not celebrate these days, it is significant that each of the four moons fell on either Passover or Feast of Tabernacles. It is like God’s signature, His stamp, telling the “House of Israel”, the SDA church–get ready. As I watched the site from my home here on the west coast, the Lord impressed upon me to do this report concerning what He has done by showing the “House of Israel” the Blood Moon Tetrad (four consecutive blood moons). And let us make no mistake about it, the odds against this being just a consequence is astronomical. 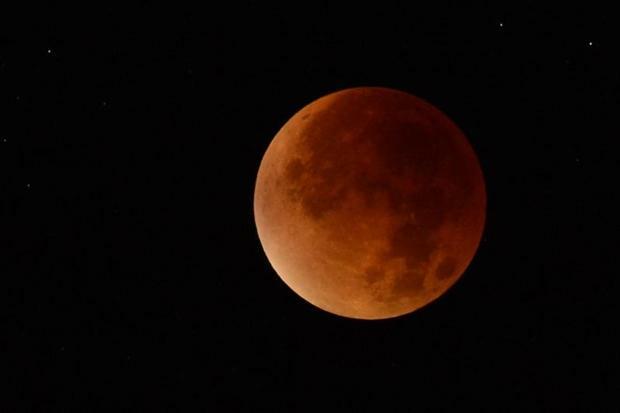 To have ONE Blood moon, also known as a “Super Moon Eclipse ” is rare. Then add to it three consecutive Blood Moons, each one falling on Passover and Feast of Tabernacle days, well let’s just say –it’s from God. In my research this has happened only 7 other times since the birth of Christ. But what made this Tetrad so unique was the two other total solar eclipses sandwiched inside the Tetrad. Here is a snapshot. The Scriptures speak of the moon turning into “blood” in three places. The above two clearly show a future time of the moon turning into blood. But as with any prophetic event to come we must always refer to the “restorer of all things”, the Lord’s Elijah prophet. This way we are not running ahead or running behind the Lord’s prophesy. We also fall into line with what the Inspired word says, just where we want to be! 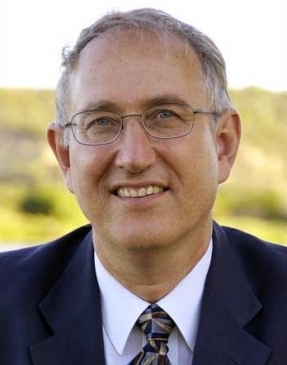 There are two places where Victor Houteff addresses Joel 2:31. “The sun shall be turned into darkness, and the moon into blood, before the great and the terrible day of the Lord come. And it shall come to pass, that whosoever shall call on the name of the Lord shall be delivered: for in Mount Zion and in Jerusalem shall be deliverance, as the Lord hath said, and in the remnant whom the Lord shall call. For, behold, in those days, and in that time, when I shall bring again the captivity of Judah and Jerusalem, I will also gather all nations, and will bring them down into the valley of Jehoshaphat, and will plead with them there for My people and for My heritage Israel, whom they have scattered among the nations, and parted My land.” Joel 2:31, 32; 3:1, 2. We notice that Inspiration says that verses of Joel 2:28-31 “met only a partial fulfillment” on the day of Pentecost. So we should expect a latter-day fulfillment. Could last week’s conclusion be the prophesied fulfillment of verse 31? We cannot say with 100% certainty obviously, but we should be close studiers and logical thinkers. As Inspiration says “weigh the evidence”(Testimonies, vol. 3, p.255). “Let both grow together until the harvest: and in the time of harvest I will say to the reapers, Gather ye together first the tares, and bind them in bundles to burn them: but gather the wheat into my barn.” (Matt. 13:30). We as present truth believers know that the true interpretation of this passage is the application to the church judgment, not the end of the world judgment. The “barn” being indicative of the pre-millennial Kingdom in Israel. When we add up all the signs that have occurred, specifically in the recent last few years, we are left with a large stack of evidence that the Lord is about to make His prophesied move. In His church begins the judgment for the living (1 Peter 4:17). Now let us look at what the message tells us in regards to what to expect right before the Lord makes His move. “Is there any way whereby we can determine the time of the opening of the seal, and the commencement of the judgment for the living? If God so faithfully revealed to the living the commencement of the judgment for the dead, it cannot be possible that He would keep secret the time of the judgment for the living. If He did, we would have no present truth in the time of the last seal; neither could there be justice in such secrecy, nor could such judgment be legal. Here we see that we shall be told of the church judgment prior to. Somehow someway God’s elect will know before hand his coming to the church. Could the Blood Moons be part of that? Could we expect the other half of the prophesy “sun shall be turned into darkness” to occur as well? Or was the 2 solar eclipses (as show above) meant as the sun turning to darkness? I think this is something we as present truth believers should seriously contemplate. The middle east is a literal time bomb as we speak , things are coming to a head rapidly. Going back to the typical harvest period of the crop, we know that it begins in the Autumn/fall. Our fall began this year on Sept. 23 and the season will end Dec. 23, which begins the Winter. In looking at our past as God’s remnant people we find that the Judgment for the dead began in the time of Autumn (Oct.1844). This was the beginning of the cleansing of the books in heaven, in the time of harvest period(Fall). Could the Judgment for the living begin during this same harvest period? “First the sickle is put to the grain, and next the grain is bound into sheaves, then threshed, after which it is put into the barn; and thereafter the chaff and the tares are destroyed. This work being completed during the autumn, it shows that the harvest is a season of time after “the summer is past,” and that it is followed by the fruitless winter period. To recap, we can see the following steps forming. Recently I discussed these end times signs with a sister in the faith. We discuss specifically how we might be notified prior to the “great and dreadful day of the Lord”. We established that His Rod says we will know about it beforehand. We discussed two possibilities. One, that maybe present truth believers will get the same dream of warning. Two, that just as the Blood Moons were visible , and maybe so too the day of darkness will be as well. A total dark day in near future right before the great and dreadful day. Only time will tell. What we are sure of is that something will be given God’s elect so that they will know the day is near. Or is it that the something has already been given (ie. Blood Moons and the two “dark days” of the solar eclipses that were in between those Blood Moons? As the middle east becomes more and more explosive and as we are entering the “time of harvest” let us be ready brothers and sisters. Those of us who are “watching” should be expecting more signs to come. His word tells us so. We are to “know at least as much in advance as Moses knew about the Passover in his day”.